7 July 1956. 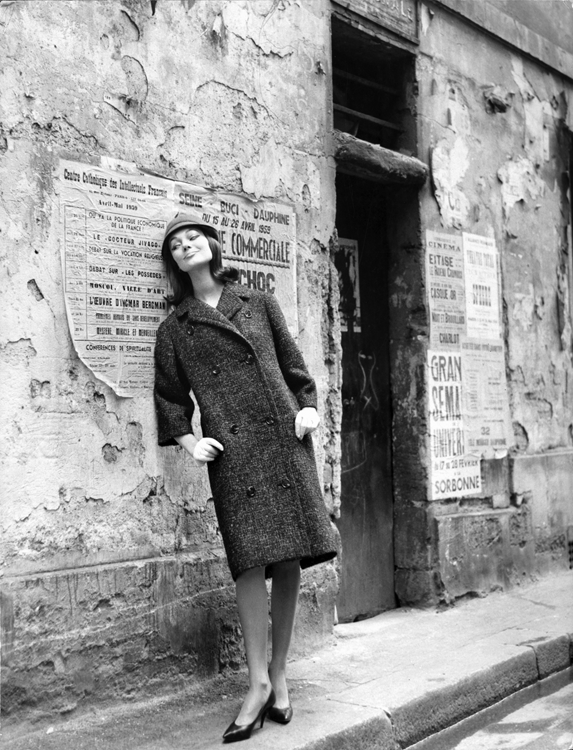 Audrey Hepburn in Paris. Photo by Bert Hardy. Read more. When Paris was liberated in 1944, the city was on its knees. Within little more than a decade, it had regained its status as a world capital of unmatchable style, romance and allure. The mood on the streets and the streets themselves had certainly improved a bit. But the really startling difference was to the city’s reputation. How did Paris manage such a stunning transformation in what we would these days call its brand image? According to Antony Beever and Artemis Cooper (Paris After The Liberation) in April 1945 the city’s population averages only 1,337 calories a day. This overall figure hides terrible imbalances between the beaux quartiers and working-class districts where many, especially the old, virtually starve to death. And the truth is that there is a group of wealthy Parisians, diplomats and visitors living a life of luxury. Everyone else has to do whatever they can to look after themselves. The black market is in full swing. There is a collective sense of shame at the way the country rolled over without a fight in the face of the Nazis. There is a settling of old scores, the most visible face of which is the meting out of summary justice: collaborators are executed or, in the case of women, their heads shaved. Increasingly politicized, Parisians stage public protests as often as celebrations. The food scarcity was acute, the cost of living was astronomical, and a pall of cynicism and futility hung over the inhabitants. Everywhere you went, you sensed the apathy and bitterness of a people corroded by years of enemy occupation. 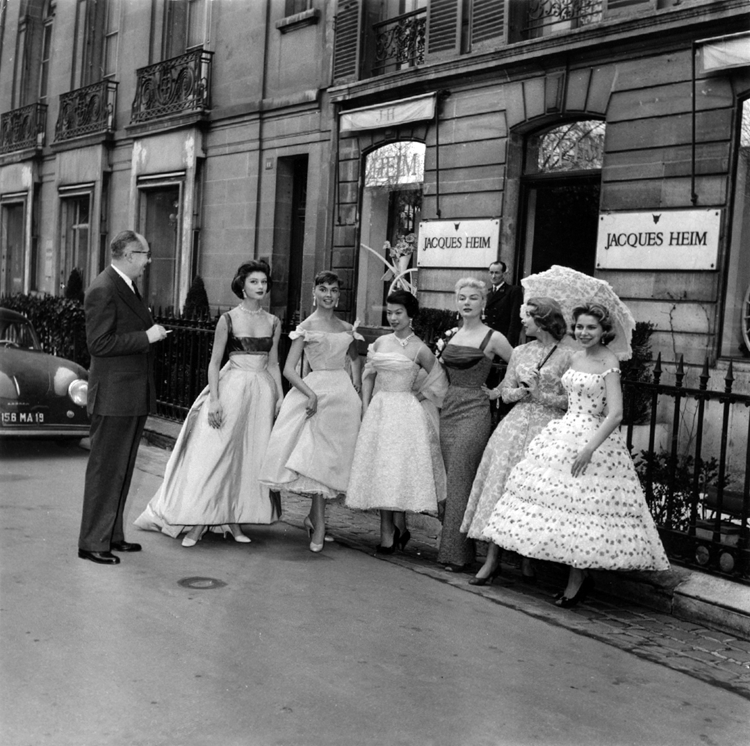 The regular afternoon showings at the great couturiers are crowded with some wealthy French women; some members of the diplomatic set; some tourists, and many members of what is called “international society.” The girls who model the gowns are scrawny and petulant looking. The dresses themselves have never been so elegant nor so luxurious. One couturier makes it a business to feed his models. “I want them to look like human beings, not skeletons,” he said. “And, if they have enough to eat, perhaps they’ll smile,” he added hopefully. The sun never seemed to rise over Paris, the winter sky like a lid of iron graying the skin of one’s hands and making faces wan. A doomed and listless silence, few cars on the streets, occasional trucks running on wood-burning engines, old women on ancient bicycles. Between the wars, Paris had embraced jazz, which was very much in tune with the city's artistic, bohemian reputation. Here, is a glimpse of Paris by night in the late '50s, with rock-and-roll dancers prefaced by some nice neon lights. It's reminiscent of the nightclub scene in Funny Face. Too bad there's no soundtrack. Here's a taste of Montmartre, Paris' bohemian quarter. There's no soundtrack but there is a goat grazing under a tree, an old man asleep at a table and a girl brushing a little boy's hair in a doorway – a nice companion piece for the tourist version of Paris and, despite the dilapidated houses, no less affectionate. It's a kind of movie equivalent to the stills of the humanist photographers. This promotional video from the early 1950s is shot by none other than the great Jack Cardiff, who has recently been working with Albert Lewin and Ava Gardner on Pandora and the Flying Dutchman and with Michael Powell and Emeric Pressburger on A Matter of Life and Death, Black Narcissus and The Red Shoes. 21st century marketers seeking to launch or reposition a product or service look for “flagship attributes” – features that will grab headlines and capture people’s imagination. 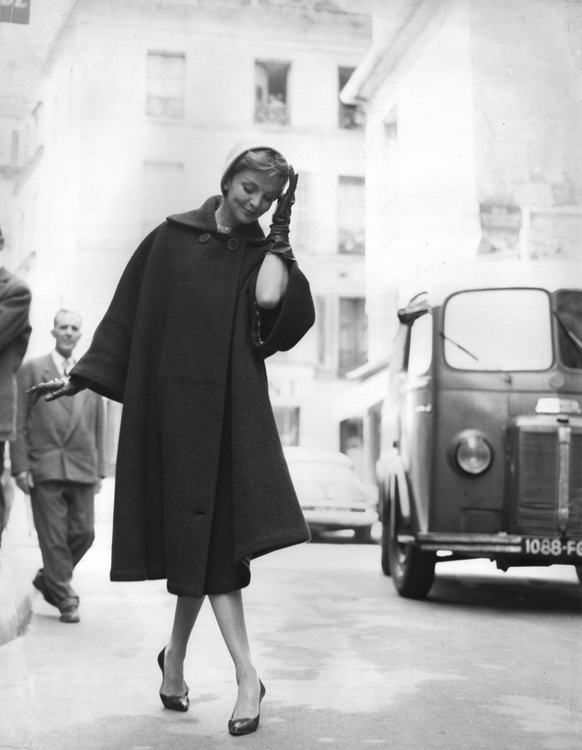 The flagship for the post-war renaissance of France in general and Paris in particular is fashion. Why fashion? Because that’s what the city was synonymous with the before the war. The sector employs some 13,000 skilled artisans in such highly specialized workshops that despite their efforts the Nazis have failed to move it to Germany. France is desperately short of foreign currency, and rich women overseas, especially in the Americas, are willing to pay a fortune for their clothes. What’s more, couture is a high-profile and exportable manifestation of l’art de vivre for which France would like to stand. 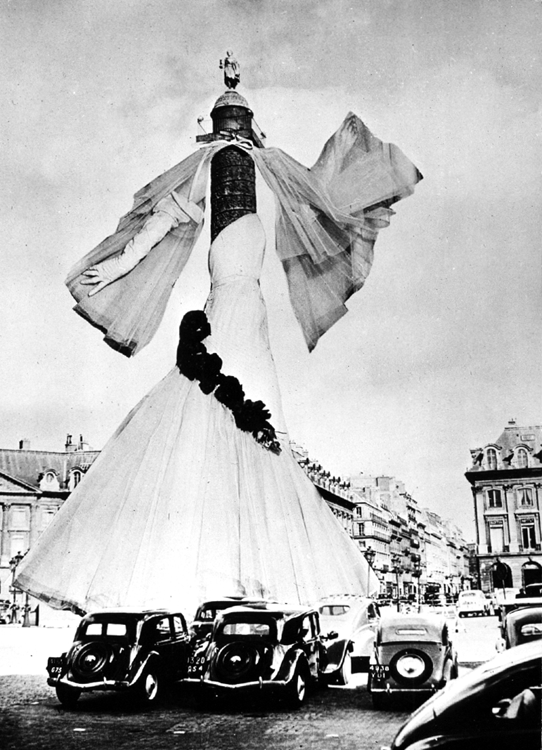 In the summer of 1944, shortly after the liberation of Paris, led by Lucien Lelong and Robert Ricci, a group of French artists and designers develop a plan to enable Paris to recapture its position as the world capital of haute couture. They create 170 figures, each one-third the size of a real person, to display the first post-war Paris collections, complete with jewellery, designed to scale by Boucheron, Cartier and Van Cleef. The dolls are shown in a miniature theatre (Le Petit Théâtre de la Mode), with sets by the likes of Jean Cocteau and Christian Bérard. The show opens at the Louvre in March 1945, and attracts more than 100,000 visitors, as well as raising a million francs for French war relief. 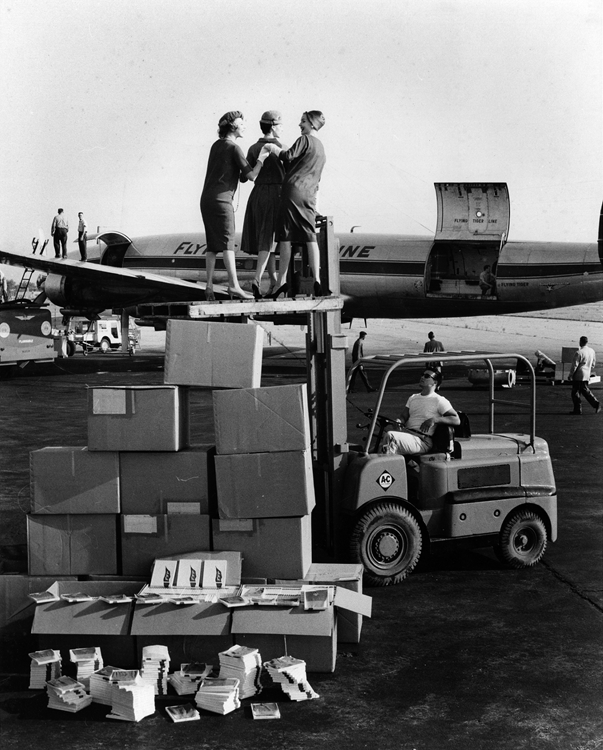 The same year, it moves to Barcelona, London and Leeds, Copenhagen, Stockholm and Vienna before crossing the Atlantic in 1946 to New York and San Francisco. 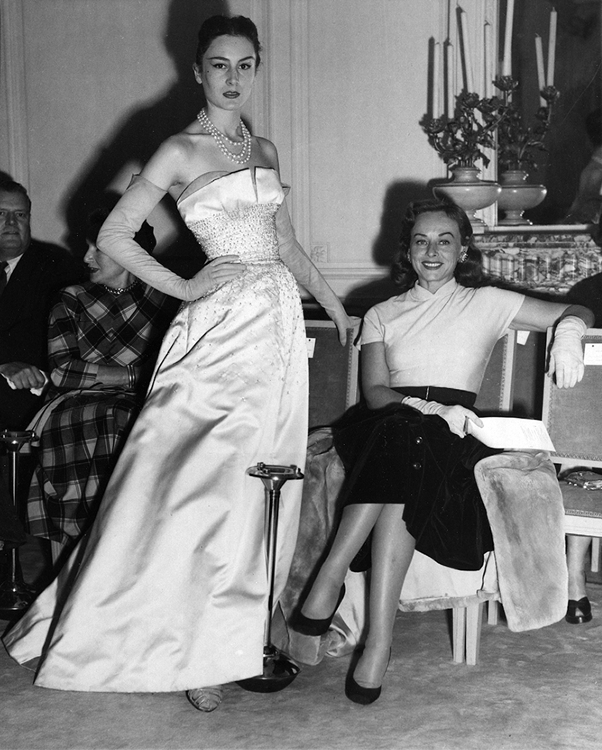 Meanwhile, the devaluation of the franc in December 1945 acts as a powerful incentive for tourists and buyers to come and spend money in France: couture has never been so reasonable! 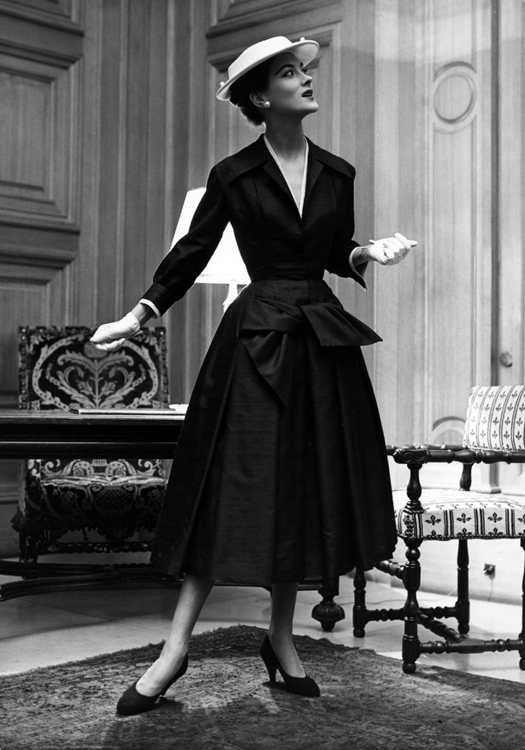 The turning point comes in spring 1947 with the launch of Christian Dior’s New Look, his first collection. The lead up is chaotic. With less than two months to get the collection ready, an untried staff, and not enough space, work has to be done in corridors and on the stairs. 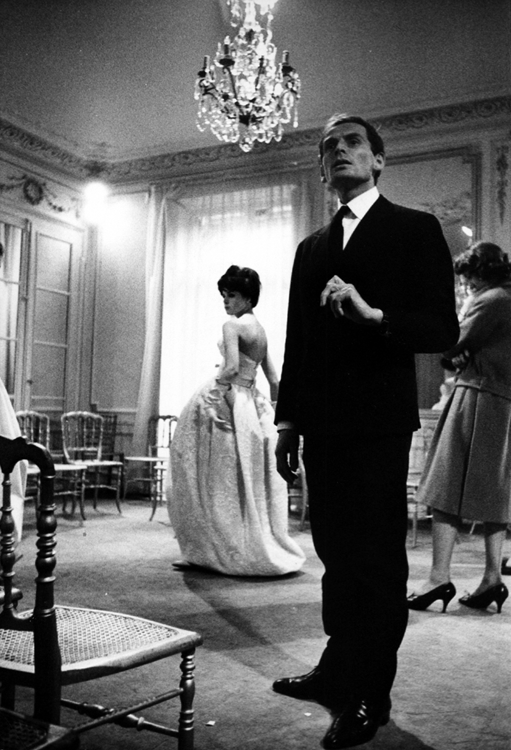 A key workroom lady collapses with nerves and a model passes out in Dior’s arms at a fitting. The New Look, a reprise of mid-19th century fashions with billowing skirts below nipped-in waists, is a sensational departure from the frugality and angularity of wartime fashion with its broad shoulders reminiscent of military uniforms. The New Look is also totally uncompromising. It calls for unusually intricate workmanship and a return to sewing techniques that have been almost forgotten. And it requires serious undergarment engineering to create the distinctive, curvaceous silhouette. “Money no object” would summarize it nicely. It’s 1947. France is in the midst of reconstruction after the war. Although fabrics are rationed, a young designer wins the world over to his daring vision of feminine elegance. 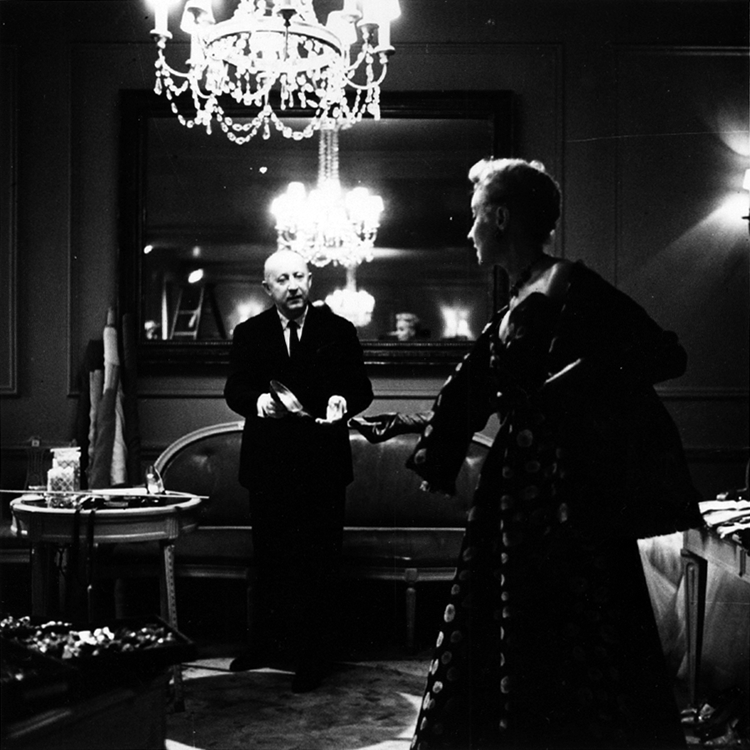 His name, Christian Dior, is destined to reach the realm of myth. But what do we know about the man himself? 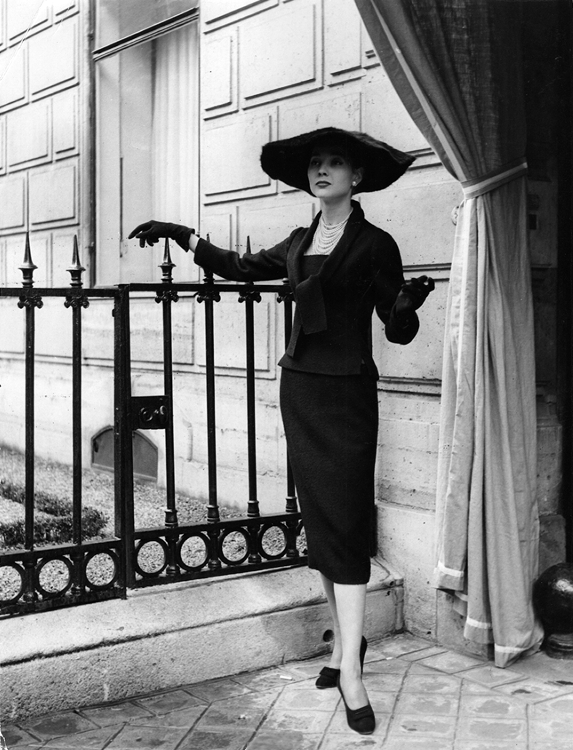 This rare archive footage shows fashion by five of the leading couturiers working in Paris in the early 1950s: Christian Dior, Cristóbal Balenciaga, Jaques Fath, Pierre Balmain and Coco Chanel. The clothes are gorgeous and it’s fascinating to see how the models move. 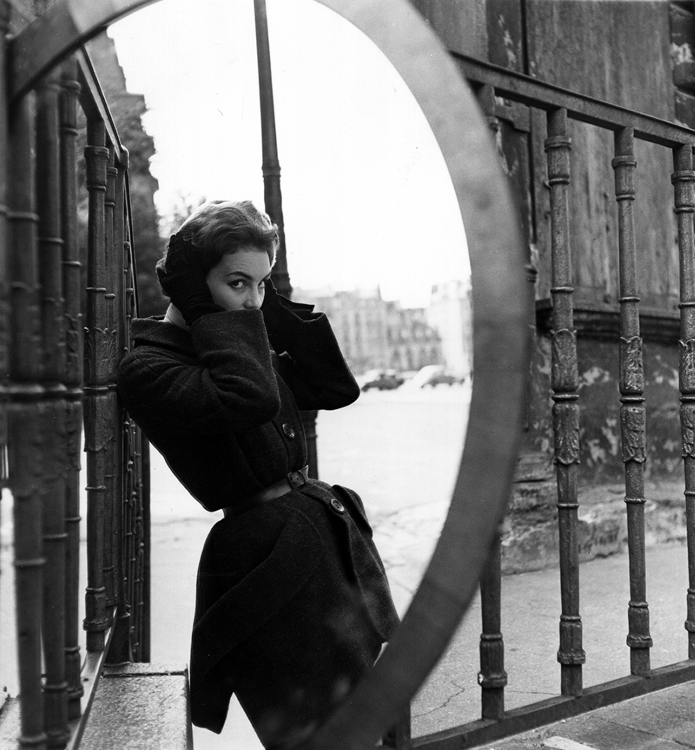 Paris – City of Fashion, is a British Pathé production that likely dates from the early 1950s. Don’t be put off by the schmaltzy soundtrack and the cringe-worthy French accent affected by Lambton Burn for the voice-over. Focus instead on the gorgeous clothes, the stylish mannequins and, of course, the shots of the city itself. For two years after the war, fashions – wide shoulders and knee-length skirts – didn’t change. SUDDENLY, Christian Dior arrived and over night we all adopted his New Look. We immediately threw away all our previous dresses and skirts. It was still hard to find material, but it was inconceivable to still wear short dresses! At that time, there were big differences in fashion between the cities and the countryside, where women went on being dressed as before, an object of ridicule for us city-dwellers. 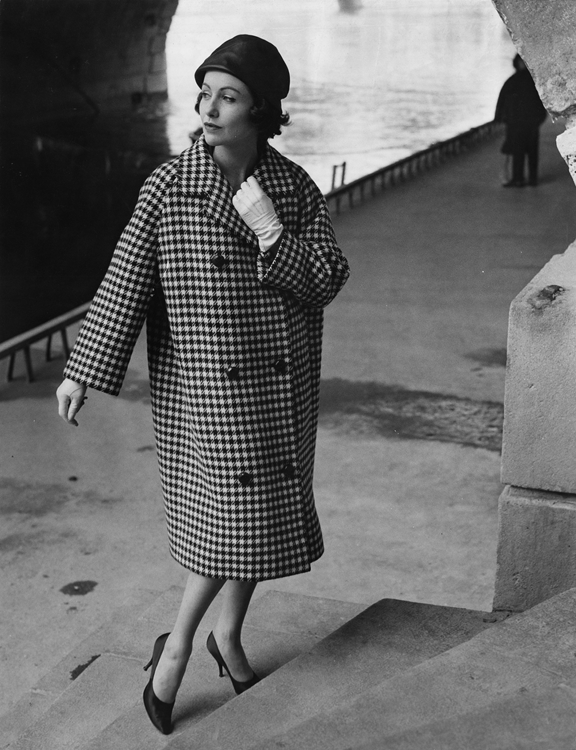 But, particularly in France, the New Look is controversial, as demonstrated by a photo shoot organized to show Dior’s clothes in a Montmartre street market. The clothes were dispatched to Montmartre in great wooden packing cases on board a camionette. The models changed into them in the back room of a bar. But when, proud and graceful, the first one walked out into the rue Lepic market, the effect was electric. The street sank into an uneasy silence; and then, with a shriek of outrage, a woman stall-holder hurled herself on the nearest model, shouting insults. Another woman joined her, and together they beat the girl, tore her hair, and tried to pull the clothes off her. The other models beat a hasty retreat into the bar, and in a very short time clothes and models were heading back to the safety of the Avenue Montaigne. That anecdote comes from Antony Beever and Artemis Cooper’s book. Little do you realize when you sit I the elegant high-ceiling, gray-walled salon, with sleek French models displaying clothes, that in the back of the charming od building there is a modern “skyscraper” as they term it. It’s actually five stories high, as high as French law allows. Here we found the workrooms and the head cutters, fitters, tailleurs and their staffs, first and second hands and apprentices. There’s also an employees’ “canteen” where we found many of them eating a hot luncheon with a bottle of beer or wine at each place. There’s a complicated system of selling. Some saleswomen are socially prominent and wear the clothes, bringing friends in to buy. There are various saleswomen who rate according to experience and ability. A crew of chauffeurs deliver the things and a concierge must be on the place day and night. There are about 12 models, a head of the dressing room, and four dressers … plus several dozen other men and women who tend to the intricate details of the business. And Christian Dior is not the only entrepreneur. 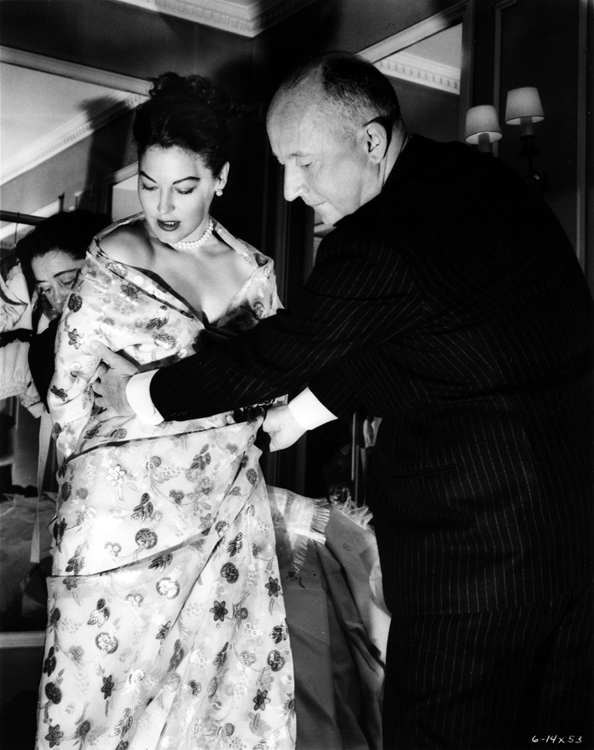 In the course of the 1950s, his counterparts, like him, create perfumes, open boutiques and license their designs to foreign manufacturers so that by the end of the decade the leading couture houses have become global brands. Paris is right back on the international map. But there’s more to Paris’ renaissance than the couturiers. Important as they are, their success and influence are underpinned by the efforts of the international fashion press, particularly Vogue and Harper’s Bazaar. 1959. 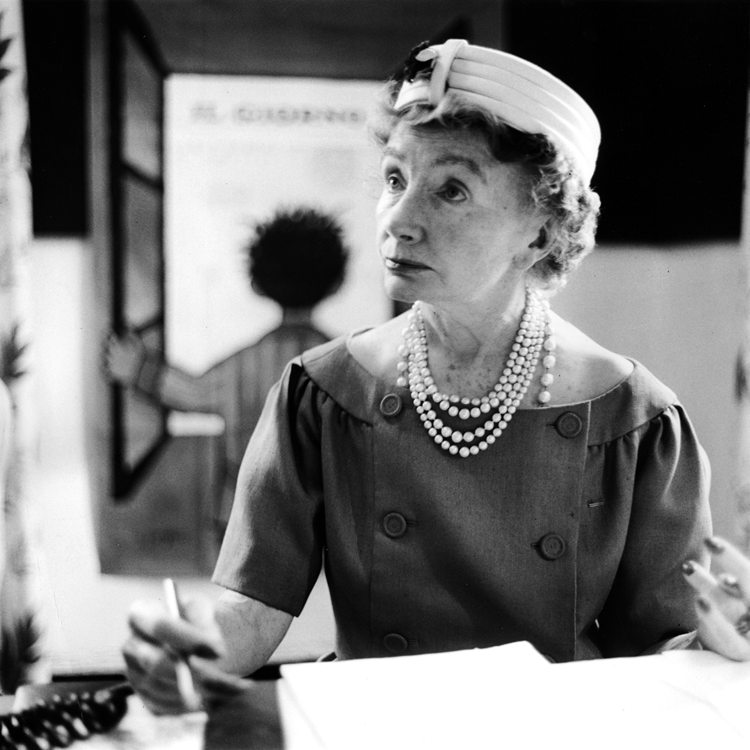 Carmel Snow, editor of Harper’s Bazaar, who sends Richard Avedon to Paris.” Photo by Gleb Derujinsky. Read more. 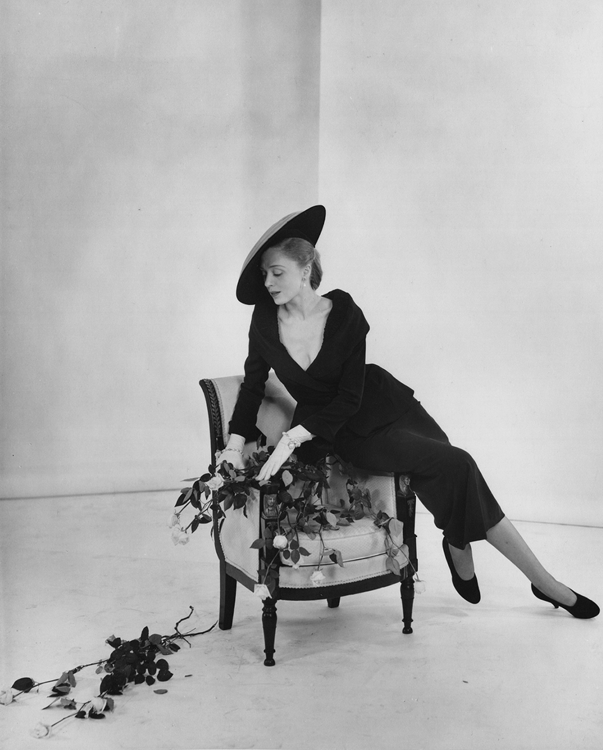 Ann Montgomery remembers how “Every fashion magazine in the western world was represented by top editors accompanied by photographers racing to record the work of the fabulous couturiers during the two-week blitz of showings” of the spring and autumn collections. 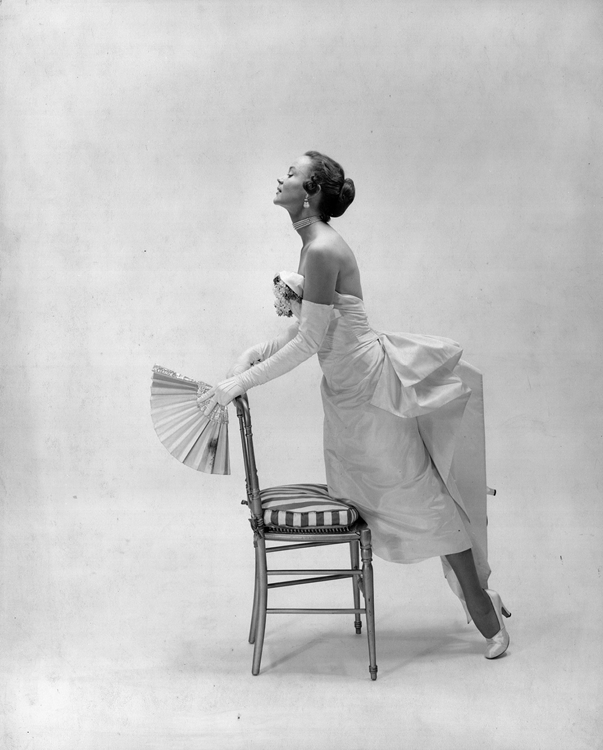 Vogue sends Irving Penn, Harper’s Bazaar Richard Avedon. 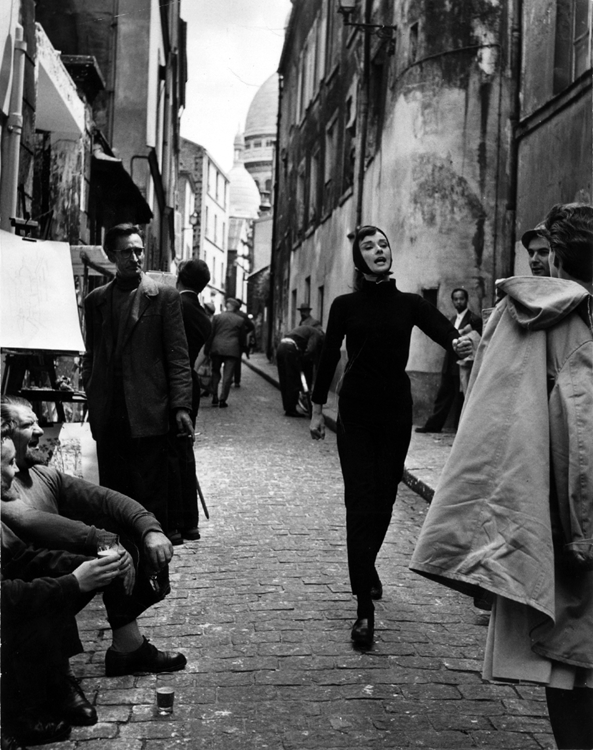 It is Avedon who probably plays the biggest part in creating Paris, the fantasy of popular imagination. 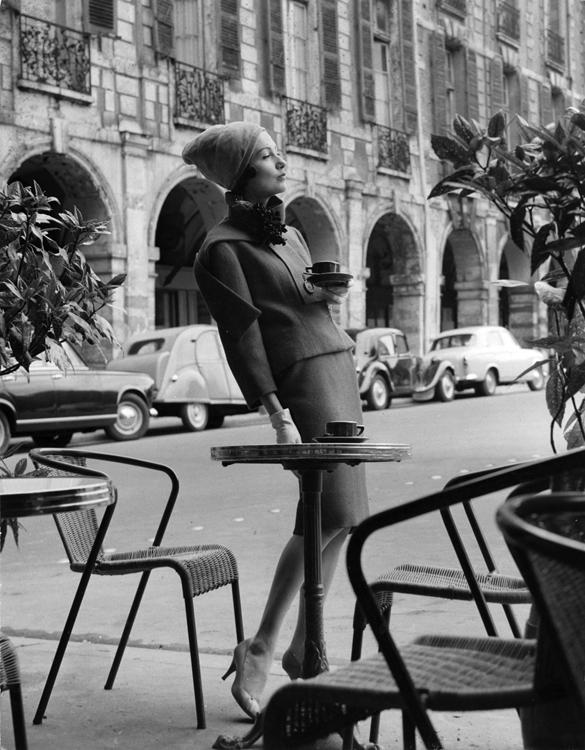 Whereas Penn captures the collections in a studio, Avedon takes the fashions out on the streets, turning Paris into a film set for an increasingly ambitious series of fashion stories. 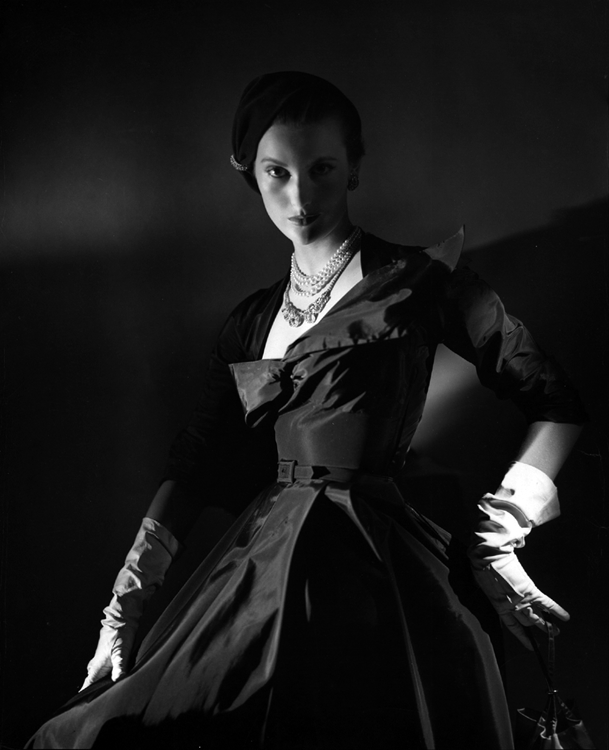 For example, for the September 1954 issue of Harper’s Bazaar he and his model, Sunny Harnett, stage a series of night scenes for which he has to use large floodlights to compensate for the slowness of the photographic film available to him. He ends up renting generator trucks to illuminate whole blocks of Paris, and police to hold back the crowds who gather to watch the proceedings. The resulting editorials together with the published work of other less famous photographers such as Gleb Derujinsky and Kenneth Heilbron revive an image of Paris that has been decades in the making. During the Belle Époque (the period between the 1870s and the beginning of World War I), Paris established itself as the cultural capital of Europe and a go-to destination for any US citizen of wealth or artistic pretension. In the 1920s and ’30s it acquired almost mythical status as an artistic melting pot, attracting a host of American luminaries including Ernest Hemmingway, Henry Miller, Gertrude Stein, F Scott Fitzgerald, Josephine Baker, Man Ray and Cole Porter. Sabrina (Audrey Hepburn) returns to Long Island, transformed by her stay in Paris and complete with all the essential accoutrements: the poodle, the clothes and the La vie en rose soundtrack. No wonder David fails to recognize her! A wonderfully rich American caricature of “Paree” – the volatile couple sharing a bottle of wine by the nightclub entrance, the moody bohemian cellar, the girls’ names (Mimi and Gigi), the fake French accents, the trippy music and the expressive dance, albeit that it reassuringly develops into a more conventional tap dance with which Hollywood audiences could feel right at home. The relationship between Paris and Hollywood doesn’t begin or end with the movies themselves. When couturiers and stars get together, everyone’s a winner. The cult of celebrity goes from strength to strength during the 1950s, promoted by a host of magazines and newsreels. 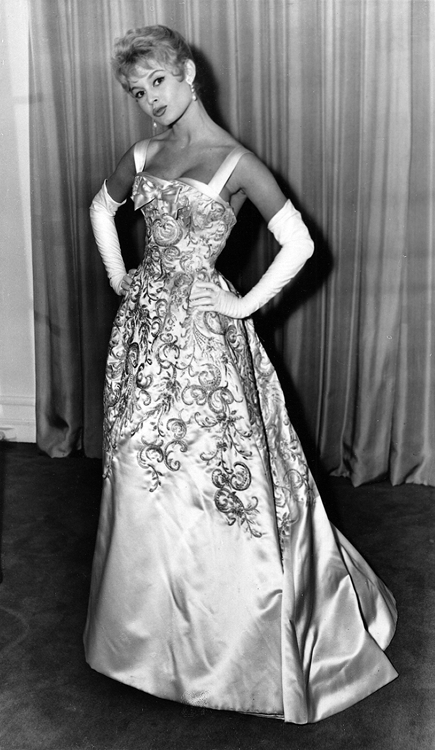 If the most famous hookup is between Hubert de Givenchy and Audrey Hepburn, there are plenty of other stars eager to beat their way to the couturiers’ salons, including Rita Hayworth, who wears a Dior gown to the preimiere of Gilda. 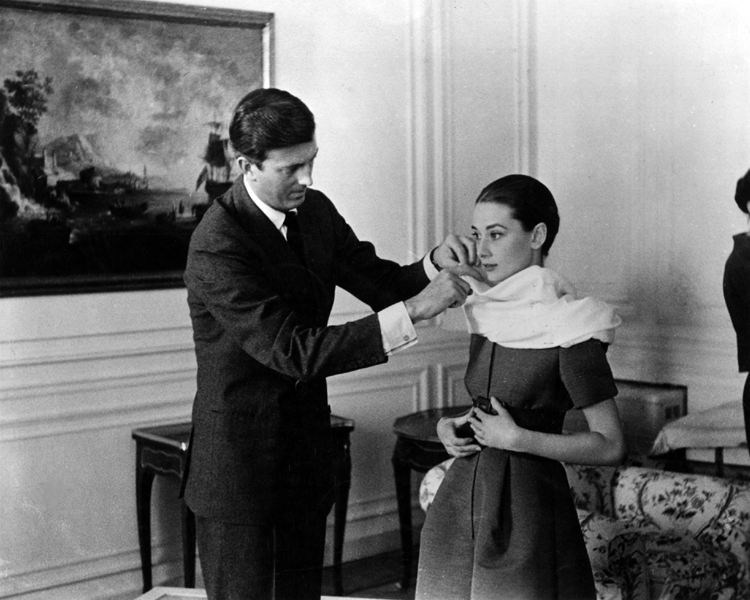 What’s more, the couturiers become celebrities in their own right. 31 March 1951. The Vendôme Column dressed by Jean Dessès. If the Americans are doing their bit to help the couturiers burnish the image of Paris on the international stage, a talented group of photographers, known as the French humanists, also lend a hand. 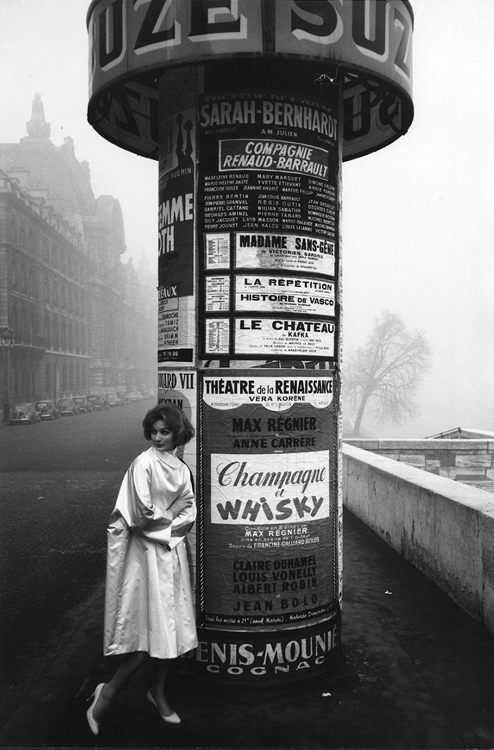 Notable among them are Henri Cartier-Bresson, Robert Doisneau, Willy Ronis and Édouard Boubat. Their warm, lyrical and witty images of street life (a small boy running home with a baguette under his arm, a young couple snatching a kiss outside City Hall, a man jumping over a puddle) capture the appealing face of a more gritty reality. Photographers from abroad such as Dutch photographer Ed van der Elsken also contribute. And what of Paris itself? The rive gauche, particularly Saint Germain, with its intellectuals, academics and artists, its jazz clubs, poets and singers, is definitely the place to be in the 1950s. At the same time, an almost unbearable nostalgia for the hedonism of the past crystallizes around threatened sites of fin-de-siècle Paris, in particular Montmartre, where the facades of the celebrated Place du Tertre, meeting place of Paris’ turn-of-the-century artistic community, are restored. As the years go by, the district is transformed into a theme-park version of its former self – a perfect fusion of France and the US! 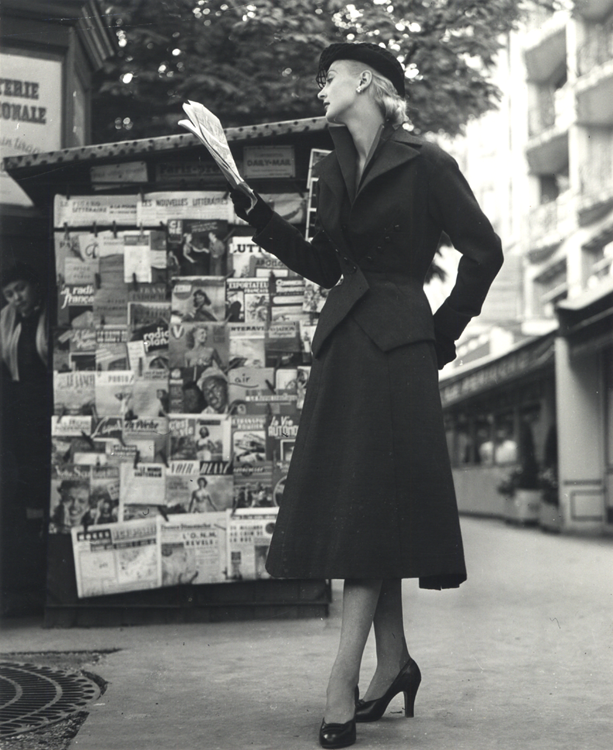 In September 1950, a young photographer comes to Paris to record the autumn collections for Vogue. He is Irving Penn, a protégé of Alexander Liberman, the magazine’s art director, and a rising star in the publication’s firmament. She is Lisa Fonssagrives, a Swedish model who has been appearing on the covers of Vogue, Vanity Fair, and Harper’s Bazaar since 1940. Lisa Fonssagrives is an artist in her own right. She began her career as a professional dancer and until recently she was married to Fernand Fonssagrives, a dancer-turned-photographer. She herself has tried her hand at photography and will go on to have a distinguished career as a sculptor. 1950. 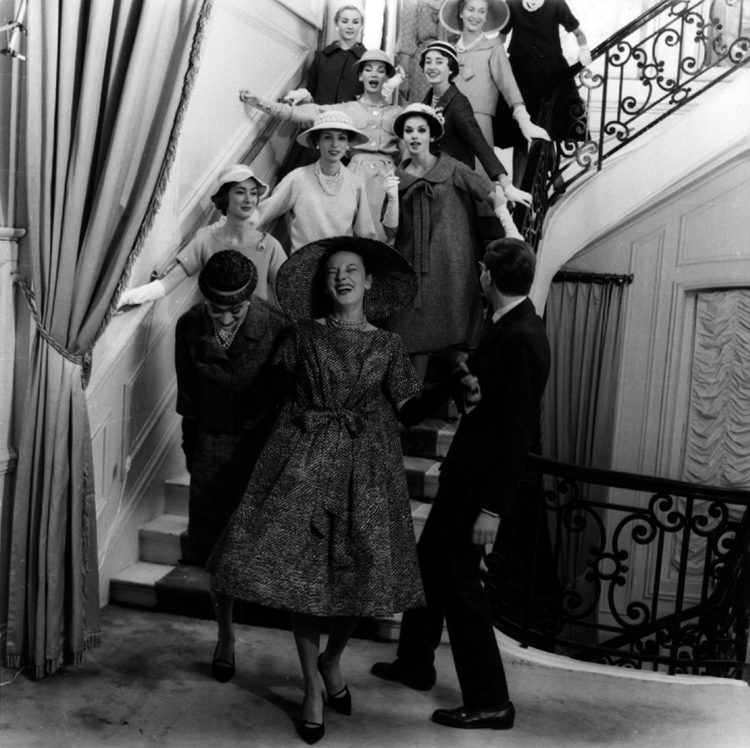 Encouraged by his wife and supported by Jean Cocteau, Cristian Bérard and Paul Poiret , Marcel Rochas sets up his couture house in 1925. 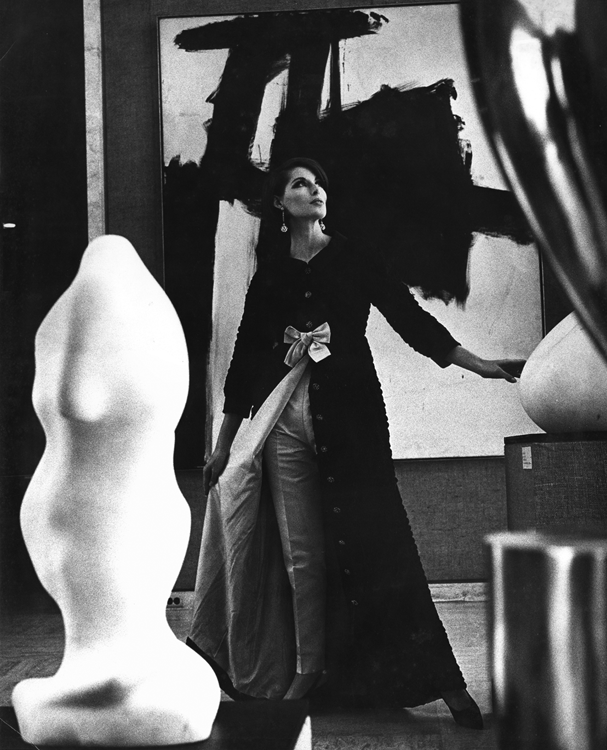 Always sensitive to possibilities, Alexander Liberman arranged for me in Paris the use of a daylight studio on the rue de Vaugirard, on the top floor of an old photography school. The light was the light of Paris as I had imagined it, soft but defining. We found a discarded theater curtain for a backdrop. 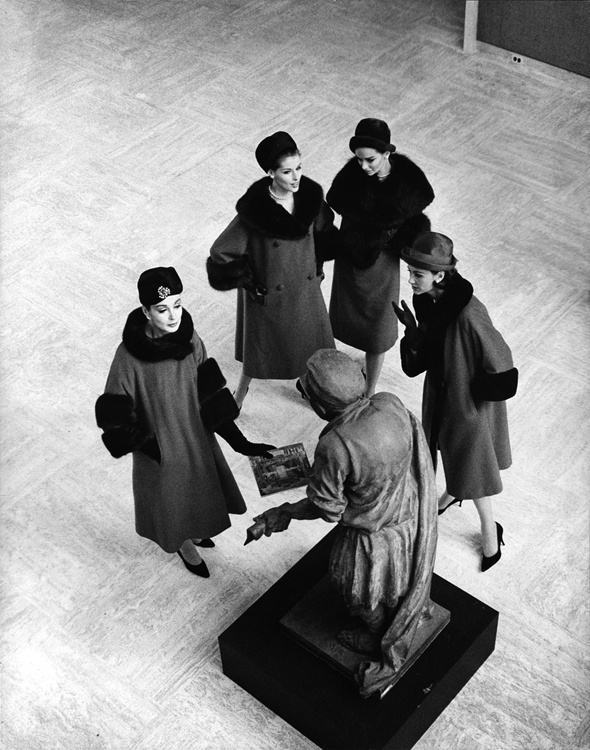 As it turned out, 1950 was the only year we were able to have couture clothes during daylight hours at the height of the collections. Clothes were hurried to the studio and back to the salons by cyclist. Into a world of photography that had equated elegance with rich and ornate props, there popped, about 15 years ago, some sparse, harsh, intensely realistic – yet still elegant – pictures. 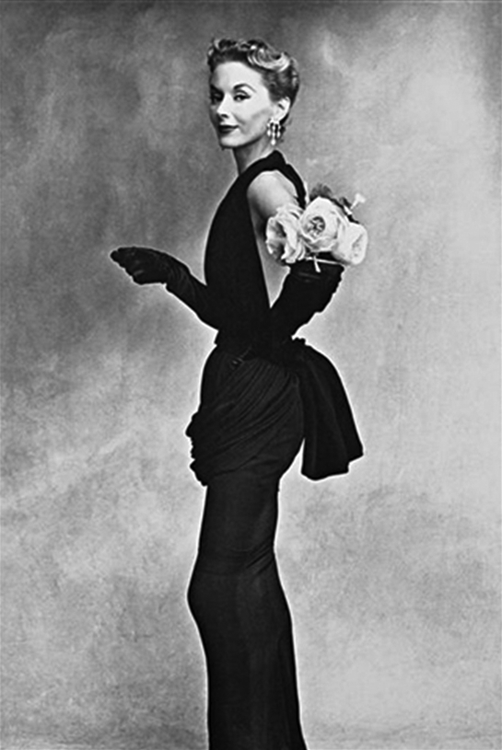 They were the work of Irving Penn, a junior art director of Vogue, who was “trying to create a new kind of fashion picture.” What he created was a new, austere style that influenced all modern photography. Later that year, Irving Penn and Lisa Fonssagrives marry; and they live, by all accounts, happily until her death in 1992. 1957. Dior fashion show in Chicago. Photo by Kenneth Heilbron. Read more. There’s a wealth of material out there and you can do worse than Google the designers, photographers and subjects in which you’re interested. The best source of information about what Paris was like during and immediately after World War II is Paris After The Liberation by Antony Beever and Artemis Cooper. Ann Montgomery’s self-published memoirs, Another Me, is a good read and contains some nice anecdotes written from the point of view of an American girl coming to Paris who ends up working as a model. 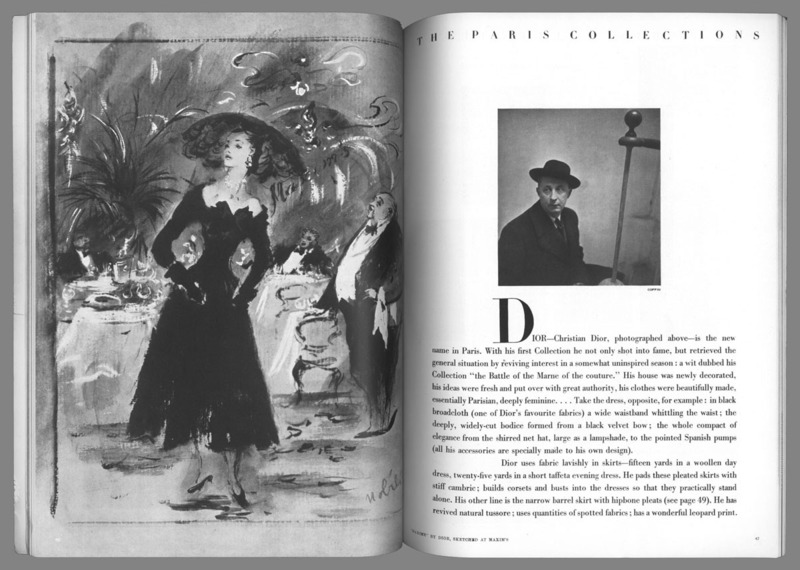 There is no shortage of monographs on Christian Dior. For a relatively brief, online option take a look at the material available at the Design Museum website, and don’t miss Inside Dior’s fitting room. More generally, London’s V&A museum has excellent articles on the golden age of couture, the world of couture and the fashion show. 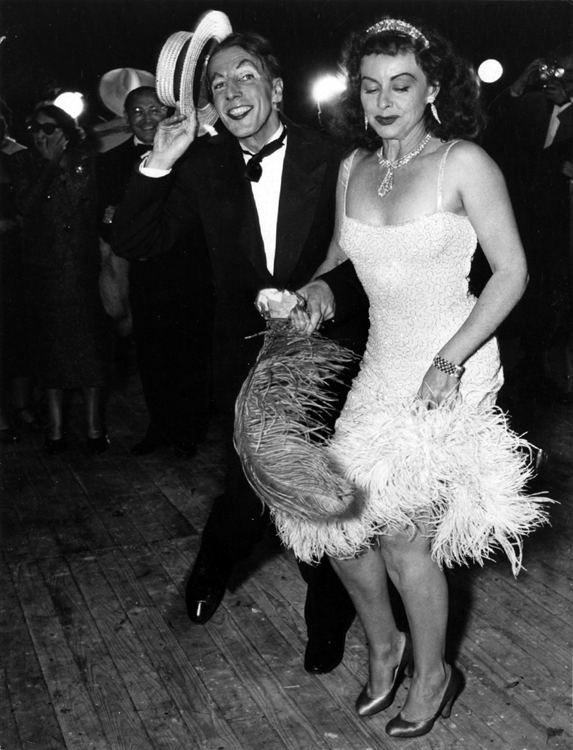 A good website for information about fashion history generally, including the 1940s and ’50s is Glamour Daze. 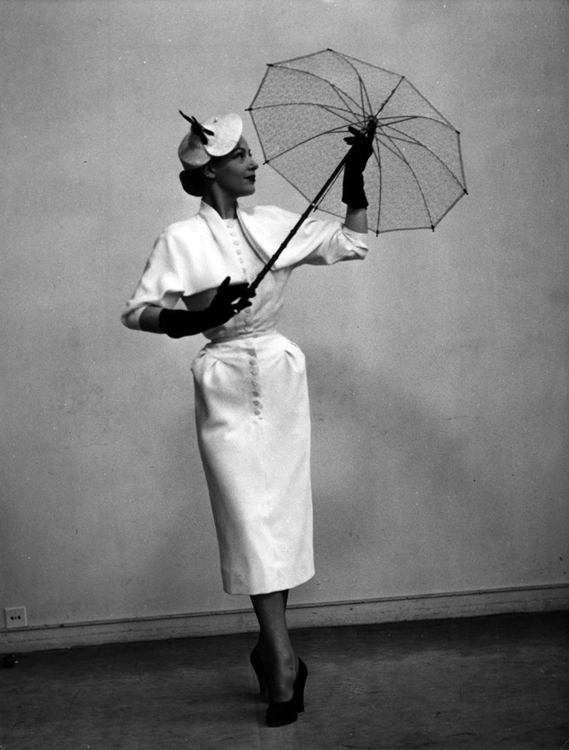 The Telegraph has an interesting article about How Haute Couture rescued war torn Paris by Anne Sebba, author of Les Parisiennes; How the Women of Paris lived, loved and died in the 1940s. 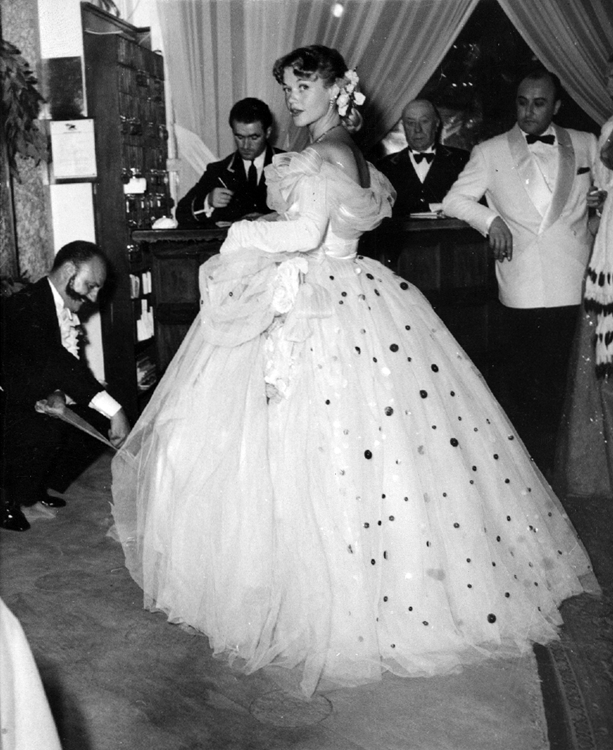 If you’d just like to look at some nice pictures of the couturiers and their dresses, Vanity Fair’s slideshow, The Haute Couture Renaissance, is for you. If you can beg, steal or borrow a copy, Richard Avedon, Made in France published by Fraenkel Gallery, 2001 is to die for. There are lots of monographs on both Avedon and Irving Penn. 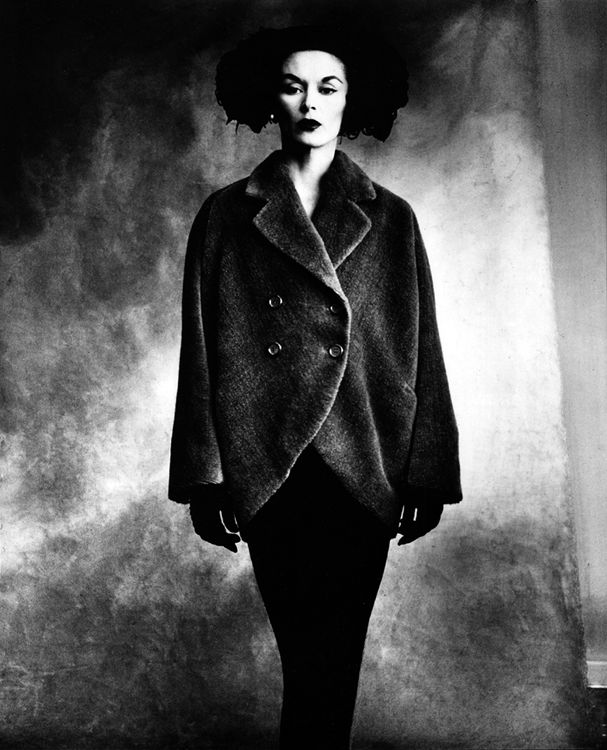 Angela Magnotti Andrews has written a nice article about Vintage Celebrity Marriages: Lisa Fonssagrives + Irving Penn. Last but not least, there’s an article by Robert Muir on Irving Penn. 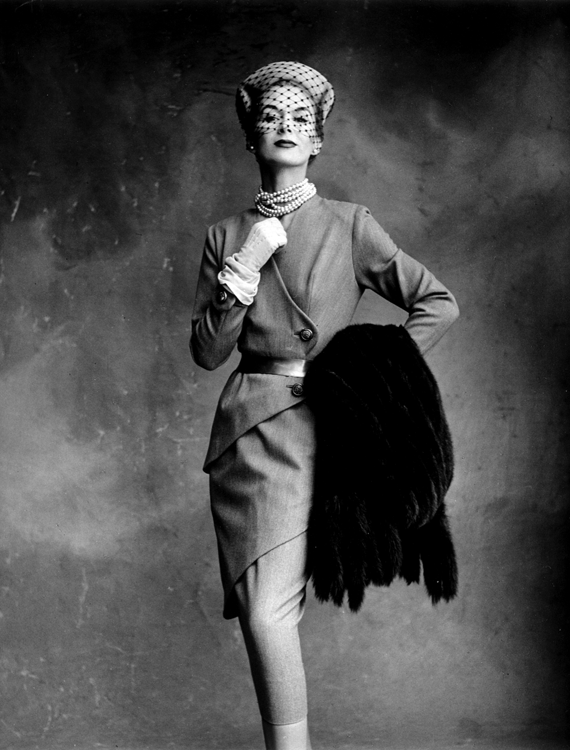 These days, when you think of mid-20th century fashion photography two names spring to mind: Irving Penn and Richard Avedon. Their work is now in the permanent collections of major museums and art galleries around the world, the subject of regular retrospectives and highly prized by collectors – a single print can fetch tens and even hundreds of thousands of dollars at auction, and rising. About 1960. Artwork for a Heilbron exhibition poster. 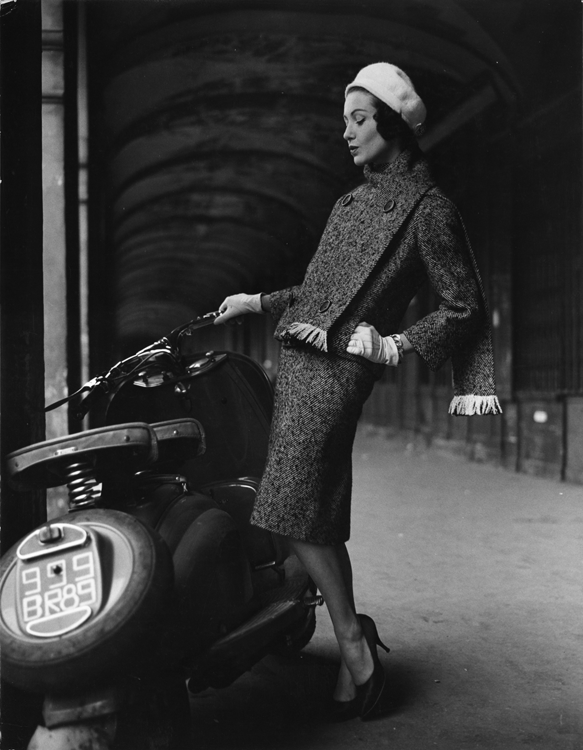 But travel back in time to the 1940s and 1950s and their contemporaries may well have been bewildered at the attention garnered by Penn and Avedon given that they were just two of a host of photographers working for Vogue, Harper’s Bazaar and the other fashion magazines of the era. 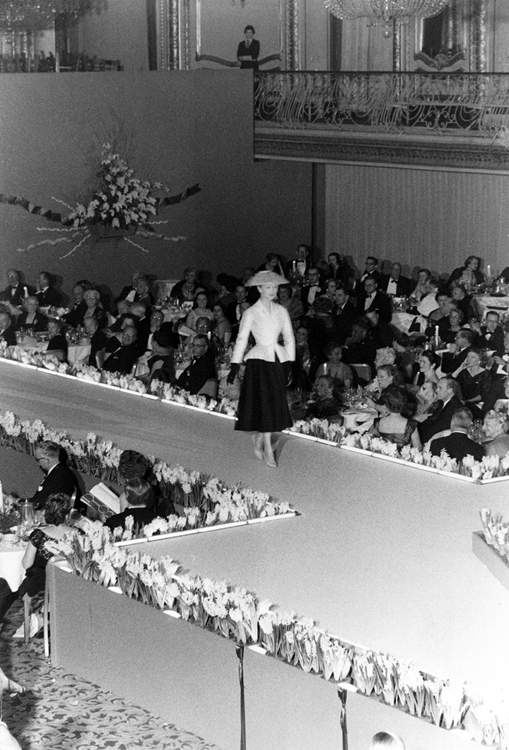 This is the era of European haute couture, dominated by the likes of Christan Dior, Cristóbal Balenciaga, Hubert de Givenchy, Jacques Fath and Pierre Balmain. 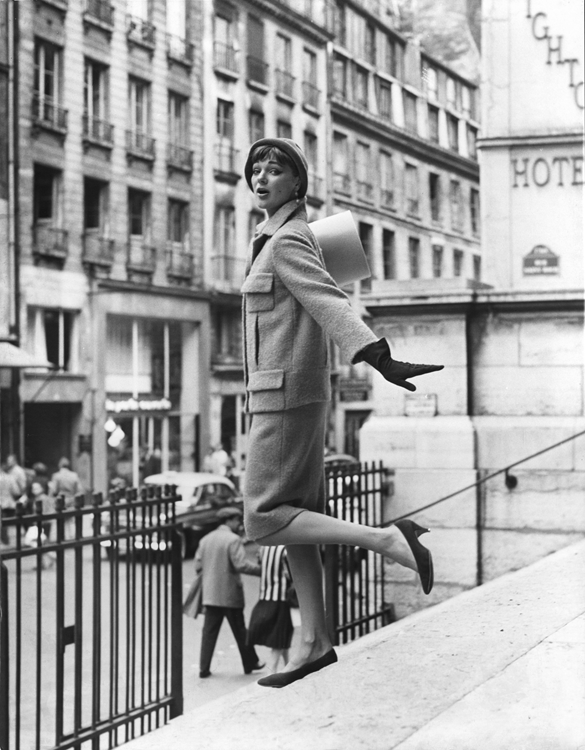 And of Paris as the almost mythical centre of the fashion universe, immortalized in Funny Face. But while Paris grabs the fashion headlines, Europe is in a sorry state, struggling to recover from the devastation of World War II. In the US, by contrast, fortunes continue to be made, the standard of living to rise and Hollywood to cement its status as a fashion capital of the world. In the Midwest, Marshall Field & Company of Chicago lead a host of merchants serving the newly rich and those with aspirations in that direction. Middle Americans too far away to drop by are served by the city’s major catalogue retailers – Sears and Roebuck and Montgomery Ward. 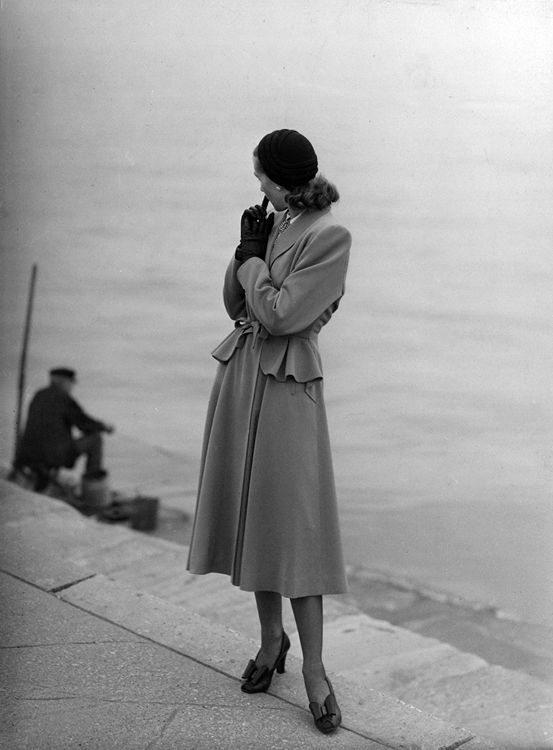 And mid-20th century Chicago has its own fashion photographer too. His name is Kenneth Heilbron. 1948. Artwork for the Heilbrons’ Christmas card. Kenneth is the second son of a prosperous millinery importer. In 1926, age 23, he is sent by his father to Paris, the city of not just of Coco Chanel, Jeanne Lanvin and Jean Patou but of Pablo Picasso, Ernest Hemingway, Josephine Baker and the Ballets Russes. He returns to Chicago with his new wife, Mildred Anderson, five years later. Years later, he recalls the Great Depression as a thing that happened to other people, never to the friends in his circle. Anyway, he takes up photography as a means of supplementing the family income, and his talent and connections ensure success. 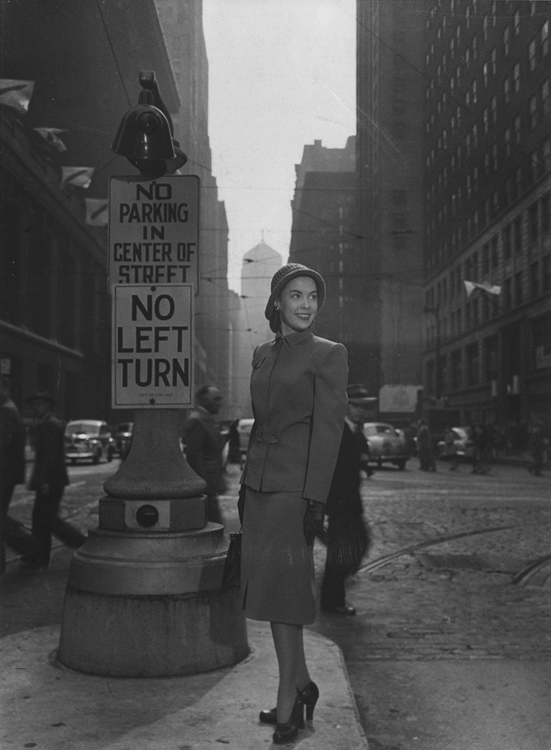 He is chosen as a Chicago bureau photographer for Life, Time and Fortune magazines in the 1930s–40s. 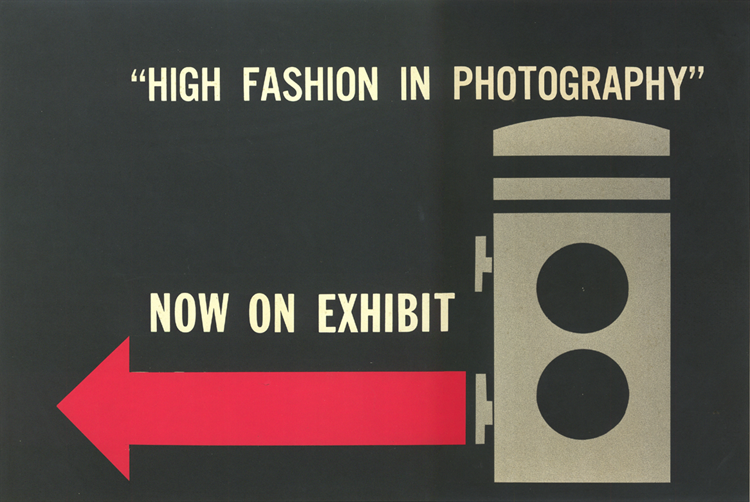 In 1938 he becomes the first instructor of photography at the School of the Art Institute of Chicago. 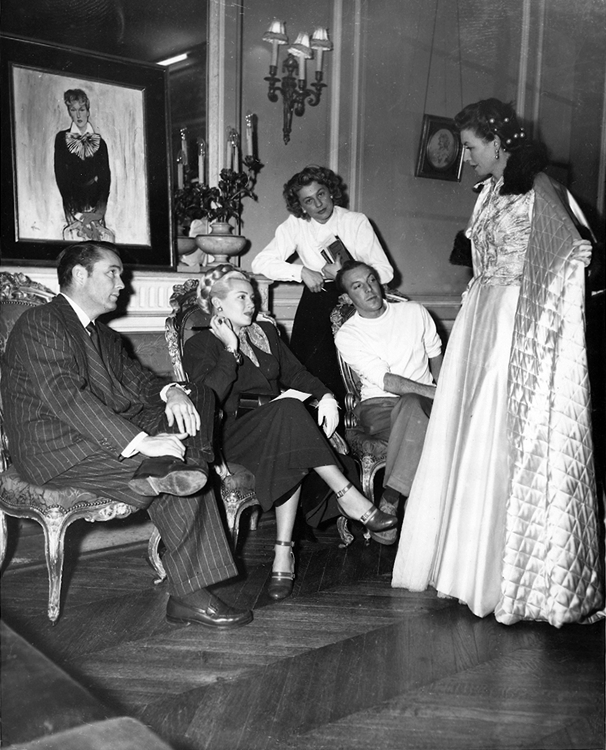 Expanding into advertising and fashion photography, around the beginning of World War II the Heilbron home and studio move to the building that will later become famous as Hugh Hefner’s residence and office –the Isham mansion on State Street, where Kenneth stages portrait sittings in the grand ballroom. Although he hires laboratory assistants, he alone operates his cameras and makes prints over which he exercises absolute control. The fashion and advertising shoots are great money-spinners and enable the Heilbrons to move to a 22-room townhouse on Wells Street in Chicago’s Old Town neighbourhood. The coach house becomes Kenneth’s photo lab, separated from his home by a private garden centred on a small lily pond. 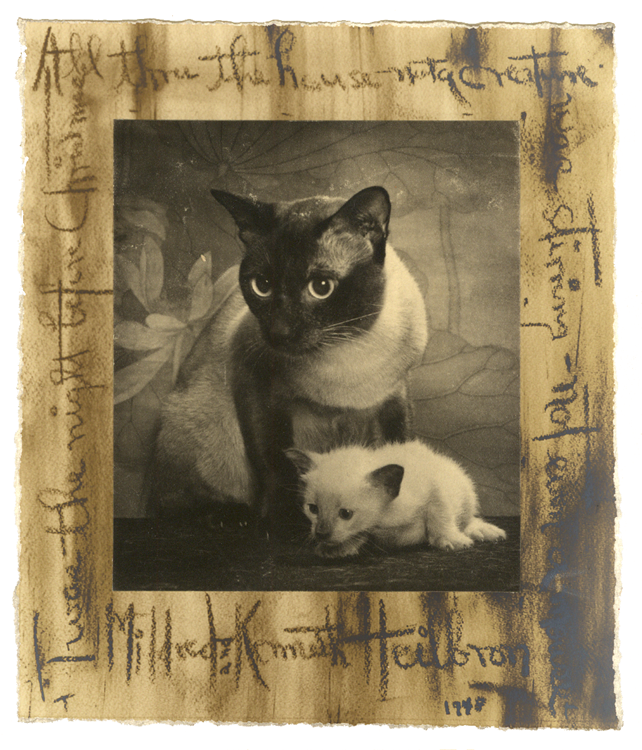 And the house itself begins to fill with American folk art, antique furniture and whole families of exotic cats, of which he took many, many photos. Kenneth himself is quite a dandy (echoes of Norman Parkinson here). Often he dresses in custom-made Parisian clothes, and for decades, his signature look includes an ascot (a cravat) and a beret. In 1985, the year of a retrospective at the Art Institute, the Heilbrons move to Galena, where he continues to photograph neighbours and officials. He declares himself officially retired from active picture making in 1994, three years before his death. It is for his fashion photos that Kenneth features on Aenigma. His biggest client in that area seems to have been Marshall Fields, but his work also appeared in the Chicago Sun-Times (including an article about Wilhelmina) and no doubt many other magazines. It is absolutely of its time. 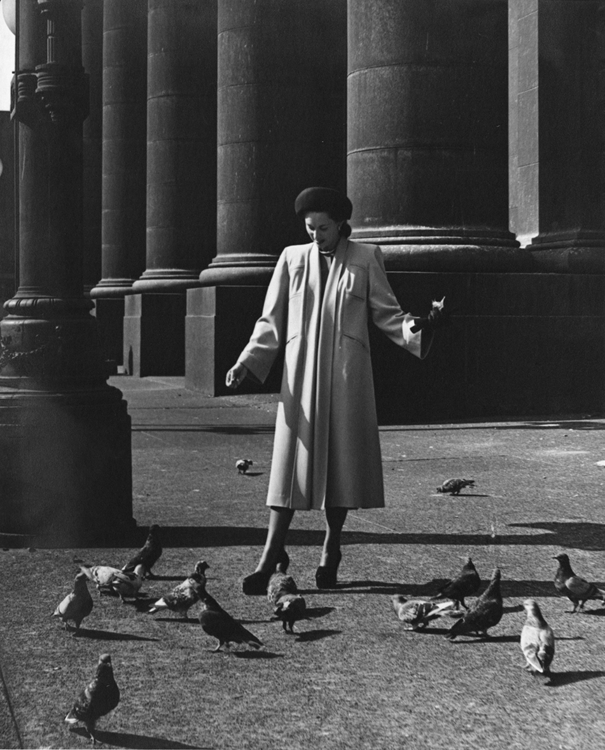 Like his contemporaries, Heilbron goes for naturalistic shots, often taken on location. There are some fabulous settings in Chicago – the Art Institute, the glazed upper deck of the original Equitable Building still under construction, on the street – and also in Paris. 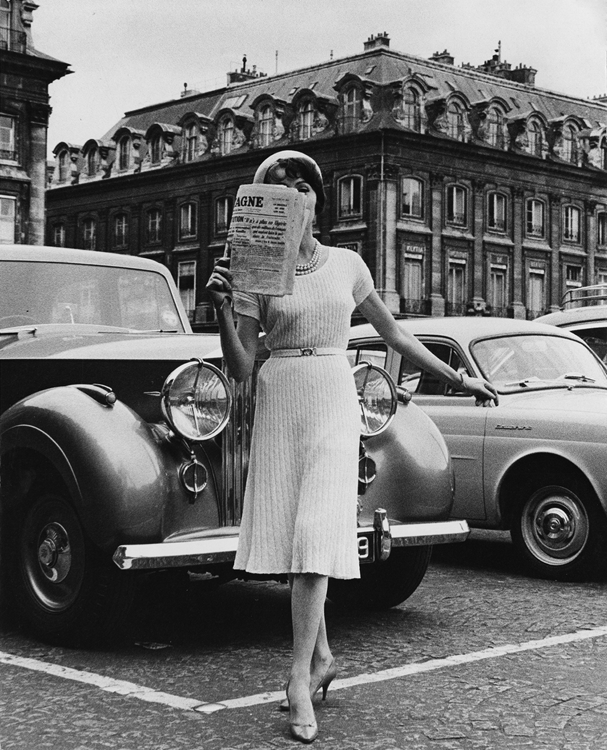 Paris, around 1960. Ivy Nicholson. Photo by Kenneth Heilbron. Looking at the images here, it’s clear that Heilbron had a great eye for composition (in 1939 he published a book on Composition for the Amateur), an ability to put his models at ease and the technique to capture the studied elegance of the times. He was also willing to spend hours in the darkroom coaxing subtle details into a single image he wanted to preserve. This helps to explain why many of his pictures exist as unique vintage prints. Around 1962. Unknown model. Photo by Kenneth Heilbron. 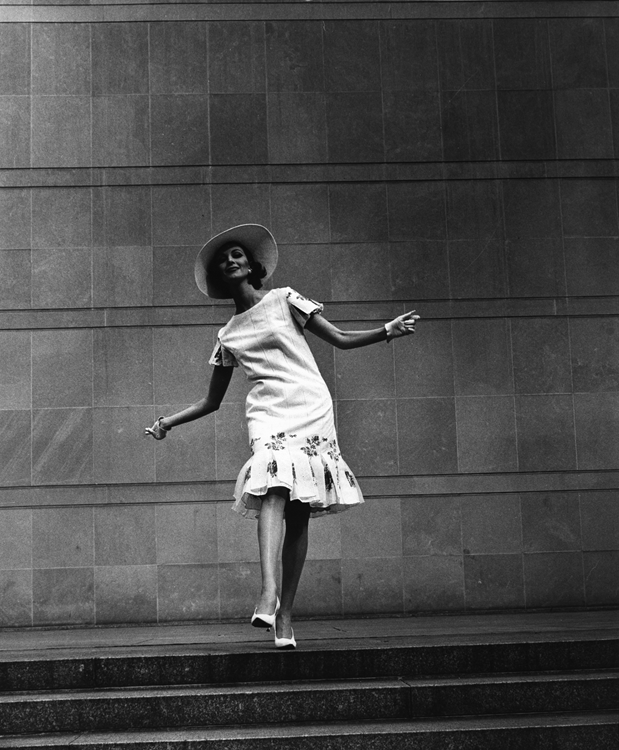 As with Penn and Avedon, fashion was just one aspect of Heilbron’s work and he looked beyond it for less glamorous subject matter. But he didn’t go to the dark places that Avedon explored, nor did he pursue an aesthetic with the uncompromising rigour of Penn. Nevertheless, these days if he is known at all, Heilbron is admired above all for the photos he took from the late 1930s through the 1940s of Ringling Brothers Circus life and performers – shots which are both intimate and penetrating. And those circus images bring to mind Avedon’s shoot with Dovima at the Cirque d’Hiver. Asked why he never tried to pose a model in a real circus, Heilbron replied that his clients would have found the concept unacceptable. He was hired to produce images of luxurious fantasy; however intriguing it might be, the backyard of the circus was not fashionable.